It is not unusual for airline passengers checking in at the flight counter to place their over-packed suitcase onto the baggage scale and hope that it is within the permissible limit, thus being spared from overweight baggage fees. However, if passengers are being charged for excess weight, which agency is responsible for checking the accuracy of baggage scales at the airport? To address these concerns, the Trinidad and Tobago Bureau of Standards (TTBS) and the Airports Authority of Trinidad and Tobago (AATT) took part in a symbolic photo opportunity on Wednesday 28th November, 2018. 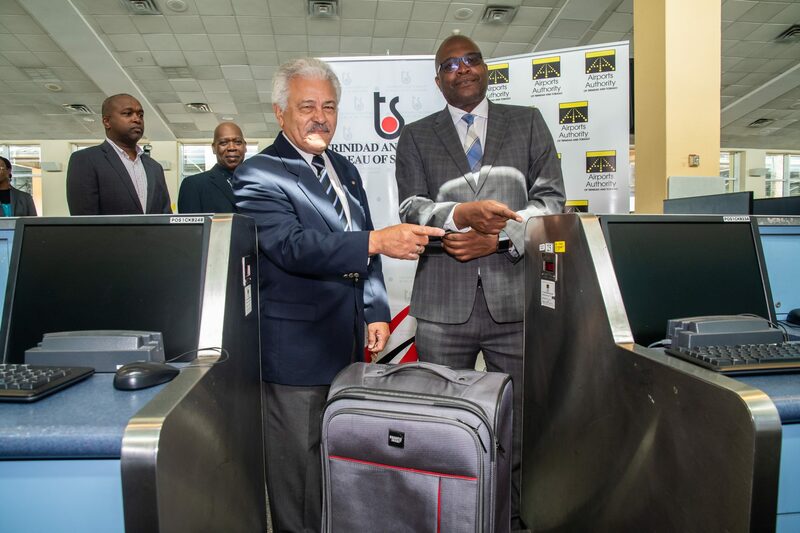 This event sought to highlight the recent completion of baggage scale verifications at the Piarco International Airport, Trinidad and ANR Robinson International Airport, Tobago. Metrology, is the science of measurement and the Metrology Act Chapter 82:06 now in its third year of proclamation, mandates the Legal Metrology Inspectorate (LMI) a unit of TTBS, to monitor and verify prescribed measuring devices used in trade, such as baggage scales to ensure accuracy. The main thrust of verification, is to guarantee accuracy of baggage weight when checking in at the airport and to ensure compliance with the airlines weight restrictions. Verification also seeks to engender trust and confidence, thereby giving the assurance that any baggage weight fees to be charged will be accurate. These actions seek to protect airline passengers by ensuring that they are not subject to fluctuating baggage prices due to inaccurate scales, especially, as overweight fees for multiple baggage can add up. Speaking at the event, Mr Lawford Dupres, Chairman of the TTBS, said “the verification exercise ensures that baggage scales would assist in boosting confidence in the operating systems at the airport”. He also shared that the TTBS is conducting scale verification exercises at supermarkets, gas stations, couriers and other sectors where prescribed measuring devices are used for trade purposes. He made these pronouncements, while congratulating Mr. Hayden Newton, General Manager of AATT, on the successful completion of the verification of the baggage scales. Customers can easily determine whether a baggage scale has been verified by the LMI. Once a scale has been verified for its accuracy, a yellow LMI PASSED verification label, is affixed to the device, which is visible to the consumer. To maintain quality control, verification checks are conducted on the airport’s baggage scales annually. If the verification label is found to be tampered with or removed without permission, the operators or owners can face prosecution according to the Metrology Act Chapter 82:06. So the next time you are heading to the airport and you are required to place your suitcase onto the baggage scale, you can rest assured, that the weight readings are indeed accurate. The TTBS commends AATT for having its devices verified for accuracy, in order to protect passengers from undue stress and uncertainty. The verification exercise builds on our commitment to provide a globally competitive market place, which protects the interest of all stakeholders involved. A commitment that recognizes the need to ensure that there is quality and accuracy of measurements in all areas of trade. VERIFIED FOR ACCURACY: Lawford Dupres – Chairman – TTBS, (left) and Hayden Newton- General Manager – AATT (right) points to one of the verified baggage scale at Piarco International Airport.